Chris from Pickup Some Creativity writes on her blog about a lovely bunting as a wedding gift. On the front, the pennants spell out the message “Love @ Home”. On the back, the fabric pennants have are just pretty, with no message. The process is mostly the same as a previously published tutorial for making a banner, but she changed some steps along the way to make it reversible. She also has some tips for making the construction a little easier. 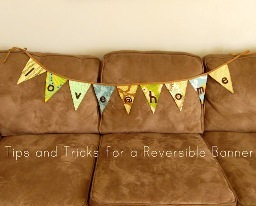 Go to her tutorial to get the tips and see how to make a reversible banner.